Associate Professor Rosemary Black has been appointed by the NSW Minister for Environment to the North Coast Regional Advisory Committee which provides an important regional consultative forum for community input into National Parks and Wildlife Service planning, policies and decision-making. On June 8 ILWS Adjunct Dr Swapan Paul received a City of Parramatta Sustainability Award - Environmental Citizen 2018 - for organising Clean-up Australia Day events annually over the past 20 years. Associate Professor Catherine Allan has been appointed to the North East Catchment Management Authority's Science Panel as a land management specialist. Institute Adjunct Associate Professor Bruce Pennay was one of four finalists for the Bathurst Macquarie Heritage Medal announced May 6 in Bathurst. This prestigious national award recognised contributions toward the preservation, conservation and protection of Australia's heritage and is awarded annually. Post-doc Dr Manu Saunders was one of six inaugural winners of the NSW Office of Environment & Heritage and the Ecological Society of Australia's Prize for Outstanding Outreach. Her topic "Where do pollinators hang out at school" was chosen as the winners' research project with years 5-8 in schools around Australia, as part of CSIRO's Scientists in Schools program. Associate Professor Rosemary Black has been appointed by NSW Minister for the Environment to the NSW National Parks and Wildlife Advisory Council, a four-year appointment (2019-2023). The 19 member council provides advice to the Minister about strategies, policies and plans directed towards attaining or achieving the objectives of the National Parks and Wildlife Act 1974. In February, Dr Lee Baumgartner was appointed to an independent scientific panel which will advise the Federal Ministyer for Agriculture, the Hon. David Littleproud, on the fish deaths that occurred in the Darling River in summer. Dr Maggie Watson is the new Book Review Editor for the ESA's official journal, Austral Ecology. Dr Lee Baumgartner, Dr Wayne Robinson, Dr Joanne Millar, Adjunct Dr Craig Boys, Jarrod McPherson, Dr John Conallin and Dr Nathan Ning, as members of the Quantifying biophysical and community impacts of improved fish passage in Lao PDR and Myanmar project , received a CSU Excellence Award on July 18. ILWS members Dr Philip Birch and Dr Emma Colvin from CSU’s Centre for Law & Justice will be taking on the role of Editor-in-chief of the journal – Salus, after Associate Professor Hank Prunckun, from the Australian Graduate School of Policing and Security, the current editor-in-chief retires at the end of the year. Professor Linda Shields has been awarded title of "Credentialled Children’s and Young People’s Nurse" by the Australian College of Children and Young People’s Nurses. Dr Lee Baumgartner has been appointed to the NSW Environment Trust’s Aquatic Sub-committee, a high level advisory group that will advise on future investments in innovative measures to improve river management across NSW.The sub-committee’s first meeting was held on February 26 in Sydney. PhD student Kim Nelson was the lead author of the paper, Nelson, K., Ragusa, A., Black, R. (2018) Qualitative narrative methodology as a framework for understanding self-identity in Niseko, Japan. Presented at the 2018 Council for Australasian Tourism and Hospitality Education (CAUTHE) conference, Newcastle, Feb 5-8, which was awarded 'Best Qualitative Paper' at the conference. Kim was also awarded one of three CAUTHE 2018 PhD Scholar Bursary Awards. Professor of Rural Health, Linda Shields, has been elected to the Board of Directors of the Australian College of Nursing, a three year appointment commencing February 2018. Institute Adjunct Dr Penny Davidson was awarded the Frank Stewart Distinguished Service Award at the 2017 National Parks and Leisure Australia Conference on the Gold Coast in October.The Frank Stewart Award recognises an individual who has provided distinguished contribution to the parks and leisure industry over many years. 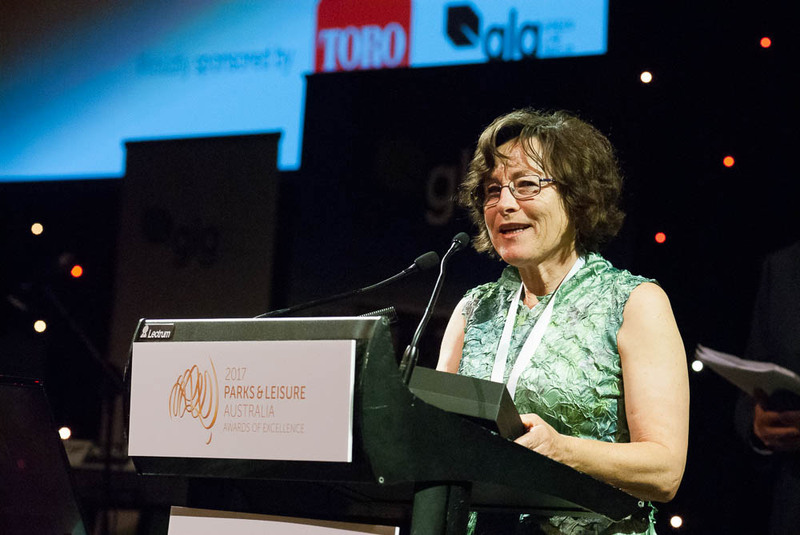 Penny was recognised for the extensive contribution she has made through her National Board representation, as well as her ongoing contributions to the industry journal - especially in the areas of academic and practitioner research.She has been a regular presenter at national conferences. In addition, Penny has been Chair of the PLA Advisory committee which advises on policy development and research agendas for Parks and Leisure. A well-deserved recipient of this prestigious industry award. Associate Professor Maree Bernoth and Denise Winkler's book Healthy Ageing and Aged Care was awarded the 2017 Educational Publishing Awards Australia for the best Tertiary Student Resource at the Awards ceremony in Melbourne in September. Maree and Denise are editors of the book, published by Oxford University Press Australia and New Zealand. It features chapters written by a number of ILWS members.The judges said: "The richness of the videos and the quality of the case studies links the content to the real world and elevates and humanises this publication." Institute members Dr Rachel Whitsed, Dr Alexandra Knight, Associate Professor Rosemary Black and CSU's Robin Harvey, were co-authors of a paper "Better rural city park planning to improve older people's health and well- being" which took out the best rural public/population health research presentation at the 2017 NSW Rural Health & Research Congress, Wagga Wagga, September 27-29.The paper is based on their Better Parks for People project. Dr Dale Nimmo was the recipient of the 2016 Wiley Next Generation Ecologist Award; a member of a project team which won the 2016 Nancy Mills Science in Parks Award; and the winner of an Australian Institute of Policy and Science Tall Poppy Award in 2016. Dr Lee Baumgartner was named as the Australian nominee for the APEC Science Prize for Innovation, Research and Education in 2016. Articles by Adjunct Associate Professor Ian Lunt and Dr Manu Saunders were published in The Best Australian Science Writing 2015, an annual collection celebrating the finest Australian science writing of the year. Institute adjunct Professor David Mitchell, AM, received a Member of the Order of Australia in the Queen’s Birthday Honours List for 2014. Institute adjunct Richard Loyn was awarded the D.L. Serventy Medal (for outstanding published work on birds in the Australasian region) at the Birdlife Australia Congress at Portland, Oct 4-5, 2014. A/Prof Geoff Burrows was recognised in the Australian Awards for University teaching program in 2012. Institute adjunct Darla Hatton MacDonald and Prof Mark Morrison’s paper published in 2010 —Hatton MacDonald, D. and Morrison, M. (2010). Valuing Biodiversity Using Habitat Types. Australasian Journal of Environmental Management 17(4): 235-243 was awarded the Eric Anderson award for the best article in the Australasian Journal of Environmental Management on Sept 28, 2011. Dr Emma Colvin was elected as the NSW Committee member for the Australian and New Zealand Society of Criminology for 2019-2020. Institute Adjunct Professor Martin Mallen-Cooper was awarded the 2018 Career Achievement Award at the international Fish Passage 2018 conference for his decades of contributions to the field. A research project "Fish passage resear ch and development at low-head barriers in Southeast Asia" led by Dr Lee Baumgartner was awarded the Disdtinguished Project Award at the international Fish Passage 2018 conference. The award recognises the collaborative efforts of the National University of Laos, the Lao Living Acquatic Resources Centre, ILWS and the NSW Department of Primary Industries in developing effective fish passage criteria at low-head barriers in the Mekong River catchment in Lao PDR. ILWS members won two of the four best paper awards at the International Communication and Media Conference (ICome) in Penang, Malaysia, October 20-21. PhD student Lucia Würsch and Associate Professor Peter Simmons won best paper for a study based on Lucia’s doctoral studies: Würsch, L. & Simmons, P. (2018) Human and strategic benefits arising from embedding Transactional Analysis in an organisation; and Associate Professor Peter Simmons and Dr Michael Mehmet won best paper for a paper based on recent research examining shark management: Simmons, P. & Mehmet, M. (2018) Respect for marine life, hope for technology, and anger at the media: A focus group and social media study of ocean user attitudes to shark management. Professor Manohar Pawar was one of the three Charles Sturt University (CSU) social work academics who have received the highest recognition from their peers when they were named ‘Social Work Educator of the Year’ at the 2018 Australia and NZ Social Work and Welfare Education and Research symposium in September this year. The award was won by Professor Pawar, Professor Wendy Bowles and Associate Professor Karen Bell for their new book, Social work: Innovations and insights, that compiled presentations and issues covered at a 2017 symposium celebrating 25 years of social work education at CSU. Associate Professor Dominic O’Sullivan’s book Beyond Bioculturalism: the politics of an indigenous minority (2007) was selected by The Royal Society of New Zealand this year as one of the 150 most important scholarly books by a Māori author since the first published work in 1815. Another book on the list, Terror in Our Midst, includes a chapter written by Associate Professor O'Sullivan. ILWS Adjunct Rob McInnes received an International Fellow of the Society of Wetland Scientists, joining past awardees from ILWS including Institute Adjuncts Professors Nick Davidson and David Mitchell, and Institute Director Professor Max Finlayson. Rob was presented with his medal at the Society's annual meeting in Denver, Colorado, May 29 to June 1. Institute Director Professor Max Finlayson was elected President-elect of the Society for Wetland Scientists at its annual conference in Denver, Colorado, May 29 to June 1. Max will be President of the Society for 2019-2020. Dr Rachel Whitsed has accepted an invitation to be on the Steering Committee of the International Spatial Accuracy Research Association. In October 2017 Dr Luiz Silva received the Odebrecht Award for Sustainable Development, a Brazilian national sustainability award for his work on a project that aims to mitigate the impact of hydro-turbines (hydropower) on fish mortality. Professor Manohar Pawar has been awarded the National Association of Professional Social Workers in India (NAPSWI)'s Lifetime Achievement Award for 2017. NAPSWI is one of the largest organisations of social workers in India. The annual award is given to a professional social work educator "who has made a significant contribution by enriching the knowledge base of the social work profession at the global level." The award was presented at the 5th Indian Social Work Congress, November 10-12, at Shree Shankaracharya University of Sanskrit, Kalady, Kerala, India. Professor Max Finlayson has been elected by the Board of the Society of Wetland Scientists as a Fellow of the Society. His award was presented by SWS President Gillian Davies at the society's annual meeting in June. Professor Max Finlayson has been appointed Senior Advisor to the International Crane Foundation (2017-2020). The International Crane Foundation (ICF), an NGO, works worldwide to conserve cranes and the ecosystems, watersheds and flyways on which they depend. Professor Max Finlayson has been appointed a Scientific Committee Member of the International Lake Environment Committee (ILEC) Foundation (based in Japan). The appointment to the ILEC Scientific Committee 12th Term is for April 2017 to March 2019. 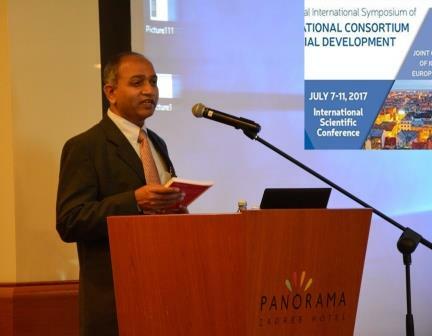 Dr Patrick Cobbinah (ILWS Adjunct) and Dr Paul Amoateng's paper "Rethinking sustainable development within the framework of poverty and urbanisation in developing countries" was awarded the Best Paper in the journal Environmental Development in 2015. Dr Lee Baumgartner, Dr Joanne Millar, Mr Jarrod McPherson, Dr Wayne Robinson, Mr Tim Marsden, Mr Garry Thorncraft, Dr Oudom Phonekhampheng, Mr Douangkham Singhanouvong were Finalist (Runner up) for the 2015 Distinguished Project in Fisheries Engineering and Ecohydrology for their work on for achieving food sustainability outcomes in the Lower Mekong region, and applying innovative technology to protect fisheries and livelihoods. 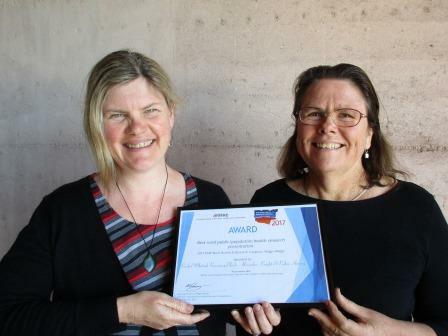 Associate Professor Rosemary Black and her colleague Professor Betty Weiler, from Southern Cross University, won the Editors of Tourism Recreation Research (TRR) Taylor a& Francis Article of the Year Award 2015 for their joint contribution "The changing face of the tour guide: One-way communicator to choreographer to co-creator of the tourist experience." Dr Hazbo Skoko, was awarded the ‘Best Professor in Economics Award’ for excellence in leadership, education and teaching, at World Education Congress, Global Asia Award held in Dubai on Sept 25, 2011.